1. Keep pulsed plasma mode? This is the dev thread for DSEV. The release thread can be found here. 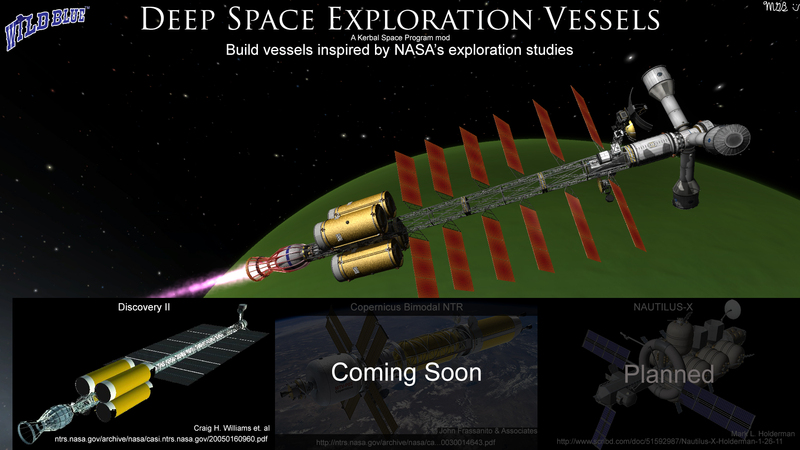 The Deep Space Exploration Vessels (DSEV) mod is inspired by numerous NASA studies on deep space exploration. Modular Fuel Tanks MM configs by Kolago. Spindle and Spin Ring concept based upon parts by ZodiusInfuser/Sirkut. It is? Nice! I didn't see a download link for 0.24, hopefully it'll be available soon. Meanwhile, I've got some engines to build. Updated the build to 0.2, still have the emissives to do on the aerospike though. Enjoy. I like where this is going. Oh ....! Is that a megnetic confinement type of fusion engine? 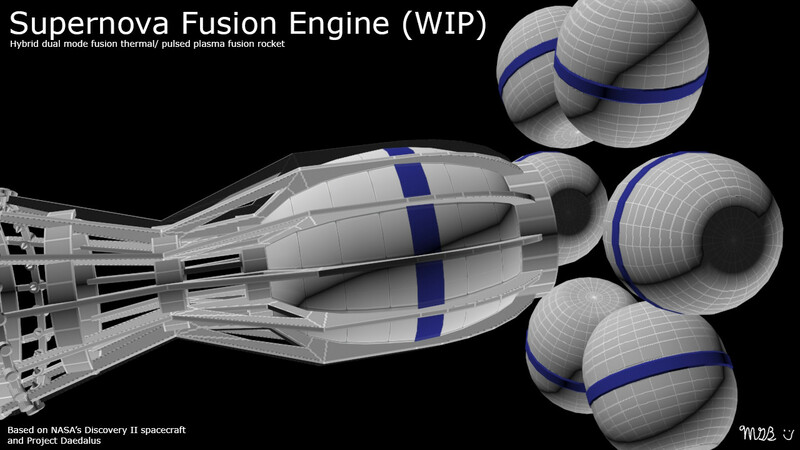 I've allways wanted to make the fusion engine from the deadalus concept. Similar size. Thanks. I'm creating each engine to offer something unique. The nuclear aerospike is almost done, I just need to figure out how to make emissives work and I'm banging my head on a wall tying to follow the tutorial I found. I've downloaded Unity 4.2.2, which I think will help (I use 4.5.2 for my own game). Well it's a magnetic confinement fusion engine from NASA's Discovery II spacecraft. 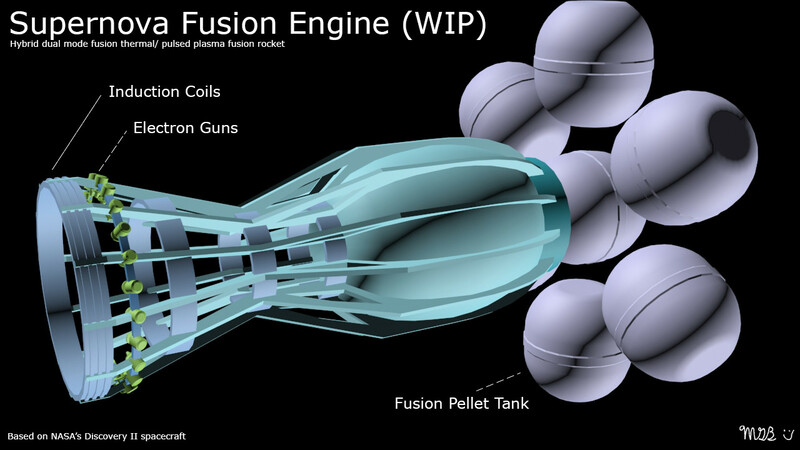 Basically plasma from the fusion reactor is augmented by propellant to generate thrust. From what I understand, the Daedalus concept is different in that deuterium pellets are zapped by lasers to generate thrust- no outside propellant is used. Edit: Oh my, Porkjet, you're a genius! I realized that if I modified the code I wrote for the nuclear aerospike to support any type of dual-mode fuels (which wouldn't take much at all, it's pretty much there already), then add some electron guns to the fusion engine, then I can have a dual-mode fusion rocket! In Mode A, only a small amount of D3He fusion pellets are consumed, and liquid fuel/hydrogen is consumed to generate high thrust but relatively low isp. In Mode B, the engine burns fusion pellets exclusively for high ISP but low(er) thrust. Brilliant! the comparison with big orange tank seems like overkill. i would love to see several nuclear engine types (lifters/landers/interstellar) and nuclear fuel or something like that. The efficiency and power of such an engine is Overkill. Making it outrageously big and heavy (which is also realistic) is the least you can do to balance that monster. Make it at least a chellange to haul that thing to orbit, because once its there you can go anywhere you want, even to other stars. 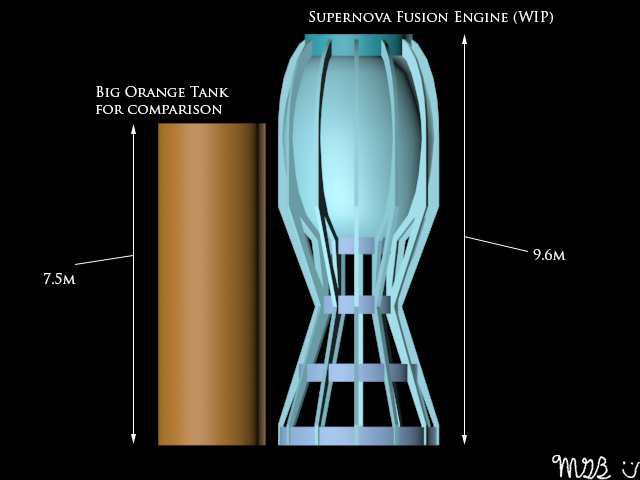 The Supernova is definitely a big engine, it combines a spherical torus fusion reactor with a magnetic nozzle. Unlike the LV-N, the aerospike's collision mesh encompasses the whole model, so you should be able to attach things to it like landing legs. A nuclear-powered skycrane design sounds interesting. Perhaps something that tucks into a 2.5m size that unfolds arms with nozzles on the end, with the reactor in the center. The Supernova is a powerful engine for sure, but it will indeed be rather heavy (30mt at present, I might up that to 50mt given that we have Heavier Rocketry now), its FusionPellets fuel will be even more expensive than FuelRods, and the engine generates a lot of heat, which means I'll have some heat radiators to work on as well in addition to the ones on the pellet tanks. I can see a single radiator module with folding radiators that's big enough to meet the reactor's needs. That will keep the part count down (I hope). Following Porkjet's lead, I'm combining functionality in the parts I make- in my case, so I can keep that part count down and avoid stuffing the build tabs. I have a third engine in mind that is simpler than the other two, called a nuclear salt-water rocket, that consumes Nuclear Salted Fizzy Water (NSFW ). 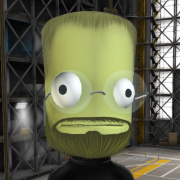 It offers both high thrust and high specific impulse, but it cannot be used in Kerbin orbit below 200km, it'll kill any kerbals 2km behind its exhaust plume, and any vessels within 500m of the exhaust plume will be vaporized (if I can figure out how to make ships spontaneously combust). Even scaled down it might be too OP for the game though, so the NSFW engine is on the back burner as I contemplate building the 2.5m DUMBO engine. Finally, fuel costs and engine costs will be high, but I plan to integrate parts into the upcoming karbonite mod that'll let you mine planets and convert materials into nuclear fuels. So a blutonium milling, enrichment and fabrication device that can plug into MKS (or do its own drilling too if no MKS is present) will create FuelRods from Ore, and an atmospheric/hydrospheric processing unit will extract deuterium for use in FusionPellets. Those are down the road though, the initial pack will have expensive fuel containers for the various fuels. Sorry about the link, I upgraded my website earlier this week and messed up the URL. I've updated it and posted the latest build. Yesterday was a detour as I refactored the multi-fuel switcher code, so the download only has the nuclear aerospike at the moment. I'm hoping to figure out emissives once and for all today as well, now that I have Unity 4.2.2. If you happen to have emissives working in 4.5.2, I'd be interested to know how. Finally, figured out emissives! This isn't the final heat map but at least I know how to heat up the engines. 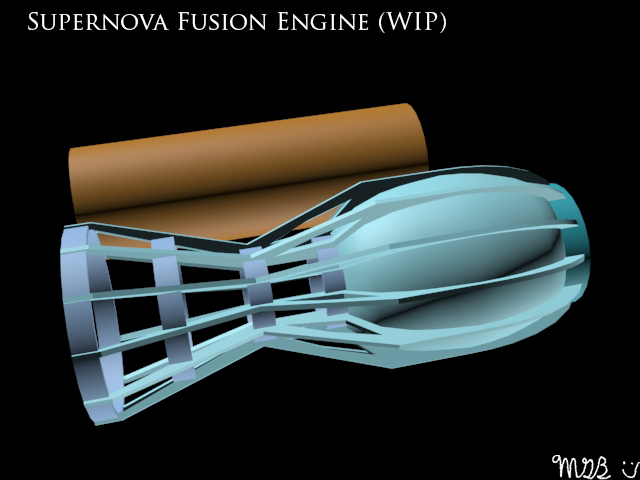 And I'm starting to texture the fusion engine, now that I've got it unwrapped. I'm trying to make it blend with stock, and I figured out how to make nice looking panel lines. 0.3 is ready, you can download it here or from the first post. I've added an alpha build of the Supernova. There's more work to do such as particle effects and sound and adding waste heat management. There are placeholders for now. I also will be adding some support trusses and of course heat radiators. It also occurred to me to see how the R.A.P.I.E.R. was done. It turns out, my MultiFuelSwitcher module wasn't needed, there's already a MultiModeEngine. Ugh. Oh well, I set up the Supernova to use multiple fuel types (my mod can handle more than two fuel modes); you'll get a small bonus if using LiquidHydrogen from Near Future Propulsion. And, I see how to add different exhaust plume effects and sounds based on different fuel types, so I'll be exploring that and updating the engine to take advantage of that research. What's really cool is that PartTools supports particle effects, so I'm guessing that's how I can make exhaust plumes and other effects. If I can find a sound clip of the Shuttle SRBs lighting off, I have some ideas on how to tweak that noise.. I don't use Tweak Scale, but I can add your request to my todo list. Thanks for the suggestion. Thanks. It's still alpha, there's a bunch to do, but it is coming along. I figured out how to create particle effects today, here's a tech demo and a look at what's in store for the engine effects when in pulsed plasma mode. If you look closely you can see the electron guns zapping fusion pellets streaming from the engine. Next up will be the liquid fuel and hydrogen fuel flames. It's getting there. This is really nice, have some rep.